Watch the 10" mini-documentary we made about Momoco featuring Miki Kato and Nic Benns, shot on location at their tiny London studio. 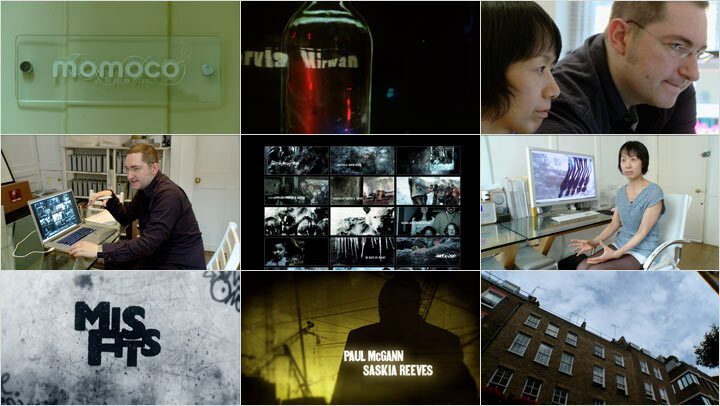 Momoco is a multi-disciplinary design and live action studio in London specializing in title sequences for film and TV, commercials and music videos. Momoco UK was founded by Nic Benns and Miki Kato. Creative director Nic Benns graduated from Cambridge University and moved to the US to study film at Cal Arts where he met Kato, who was studying for an MFA in Graphic Design. Momoco has been designing title sequence since 1996, starting off at Imaginary Forces and yU+co, before setting up Momoco offices in L.A. and London in 1999. Sister company Momoco L.A. (Harold de Jesus and Marcel Valcarce) rebranded in 2005 to become inMotion Studios. Momoco wrote, produced and directed the short sci-fi movie The Shell (a.k.a. Copelia) in 2010. (watch on Vimeo). Film titles designed by Momoco include Alien Vs Predator, Laws of Attraction and Beyond the Sea (2004), Hard Candy and Into the Blue (2005), 30 Days of Night, Dangerous Parking (2007), Misfits, and many more. In 2010, Momoco was nominated for a BAFTA in the Best Titles category for the main title for E4's TV show Misfits. That same year, the company won the Type Director's Club (New York) Excellence in Typography Award for their opening titles for An Education. In 2012 Momoco was nominated twice for an Emmy Award for Outstanding Main Title Design for Strike Back and Great Expectations, winning for the last title. Clients include global brands such as Unilever, Virgin and EMI, film studios such as Warner Bros, MGM and 20th Century Fox, and networks such as Sky1, HBO and the BBC. Nic Benns was one of the three title designers who presented at the Forget the Film, Watch the Titles event at MU in Eindhoven in 2009.